While cleaning out the kitchen cupboard, I found a large bag of dried black beans tucked in the corner behind the canned foods. This reminded me of a thread I had read in one of the Ravelry discussion groups about the variations of color people get from using black beans as a blue dye. I thought it would be interesting to find out for myself the color and dye potential of black beans. 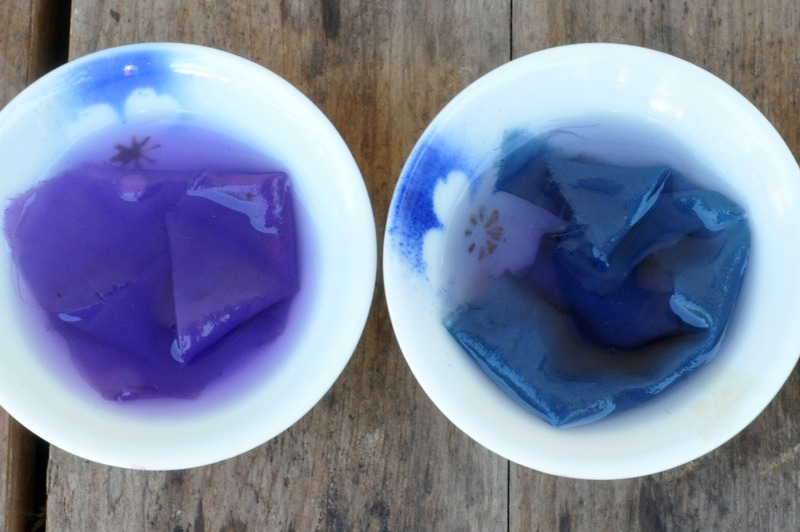 This post discusses the results of my experiment using different types of water and various modifiers to see how they interact in the dye-bath. 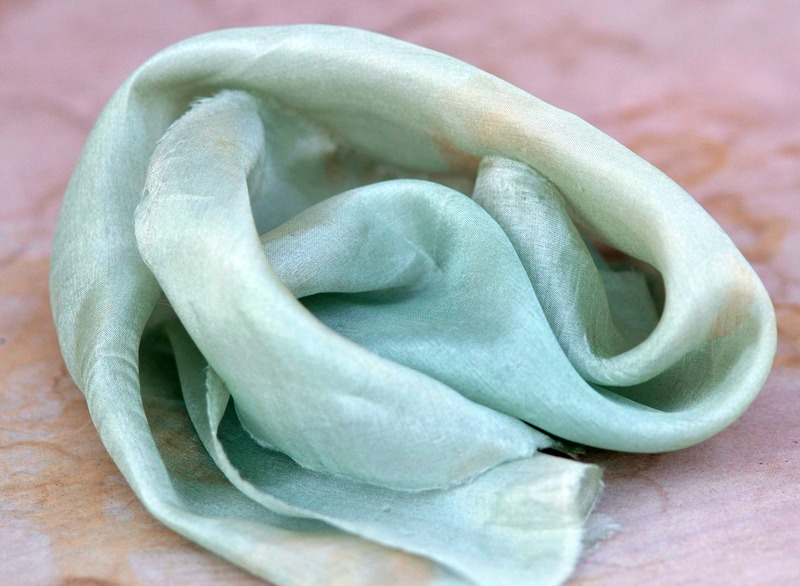 Modifiers are chemicals and minerals that assist in dyeing. They can shift or alter the pH in a dye-bath from acid to alkali (and vice versa) to enhance colors. The modifiers that I used in this experiment were: washing soda and baking soda. 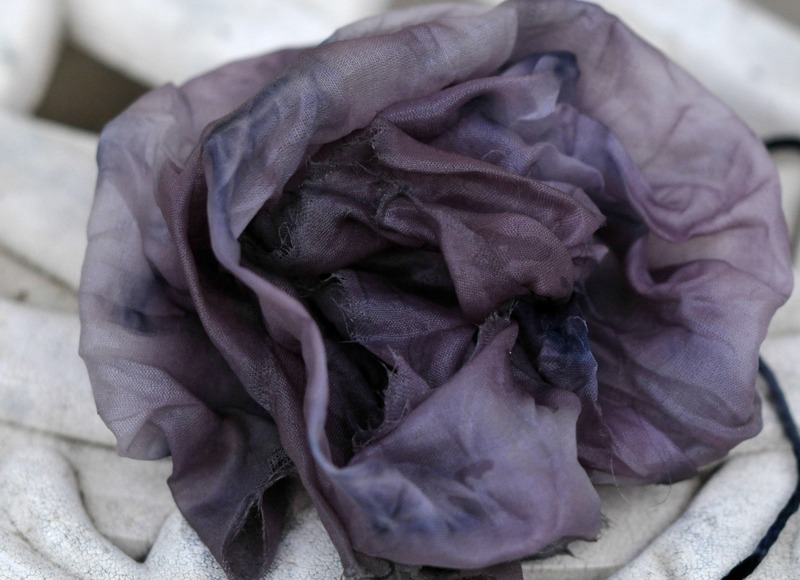 Other common modifiers (which I did not try for this experiment) are alum, iron (alkaline), and vinegar or citric acid (acidic) in most of my dyeing. Following are results of the different combinations that I used. It is definitely worth experimenting, as I have discovered there is a vast difference in color and hue depending on the combination of water and modifiers. I am pleased with the beautiful results that can be achieved with a simple kitchen staple; the black bean. 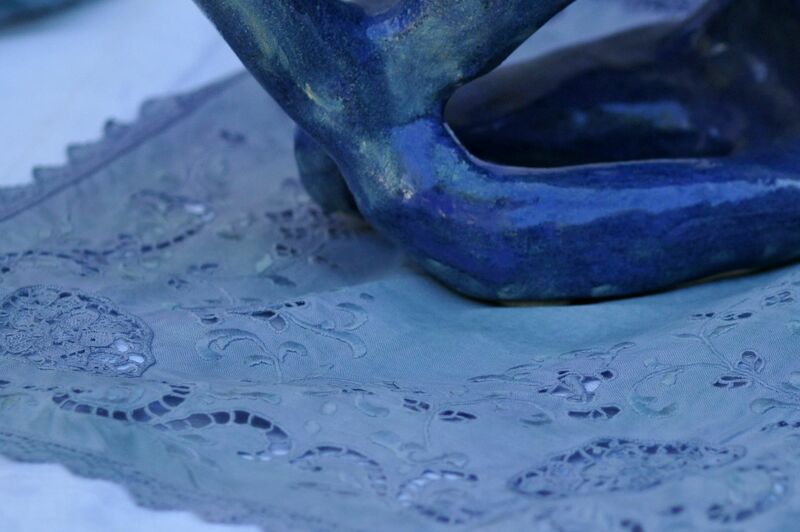 Below are detailed photos and notes, documenting the various process. First, I started off by soaking the rinsed beans in a pot filled with enough water to cover the beans. After a few hours of soaking, I noticed the liquor (bean juice) was already showing a dark murky color; a result from the water absorbing most of the pigments from the black beans. The pot with the black beans was left to soak overnight. The next day, the liquor (bean juice) was drained off to another pot; the soggy and plump looking beans were tossed into the compost. Then the liquor (bean juice) was poured into two Mason jars. In one of the jar, I stirred in a tiny amount of baking soda, and left the other jar plain without modifier. 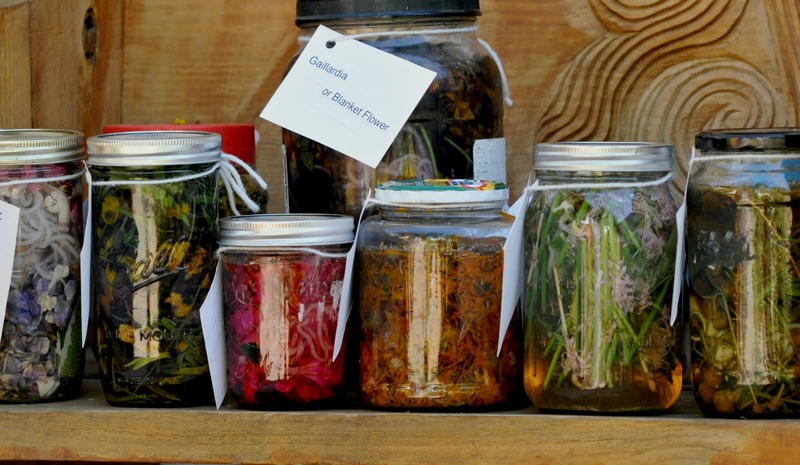 Then, I placed into each of the jars, the same amount of wool and silk samples. The jars were then left out for another day before I opened it the following day. After seeing the results from the first experiment, I am also curious to see the effect and the difference in color when using soft or distilled water instead of tap water. I was fortunate to have had collected a container of rain water from last year’s rainfall. I bought a pound of organic black beans in the grocery store. The beans were rinsed and soaked overnight in a large pot filled with rain water. The next day, the liquor (bean juice) was drained off from the beans and poured into two separate containers. This time, I kept the soaked beans to make a chili dish for dinner (don’t tell John). 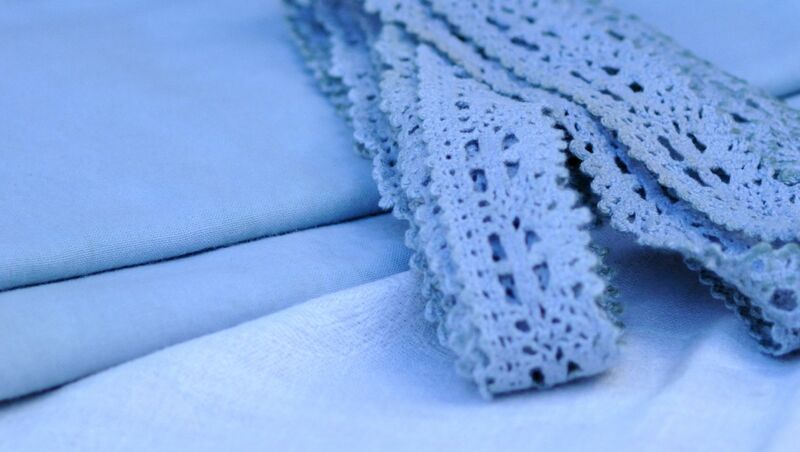 I have two pieces of cotton muslin and some cotton trimmings: one piece of fabric and trimmings was pre-washed in plain tap water (first batch); another piece of fabric and trimmings was pre-washed in washing soda (second batch). After they were rinsed clean, I placed the first batch that was washed in tap water into one of the container; and the second batch of samples into the second container. The solution in the first container remained unchanged as I immersed the cloth samples in the liquid. 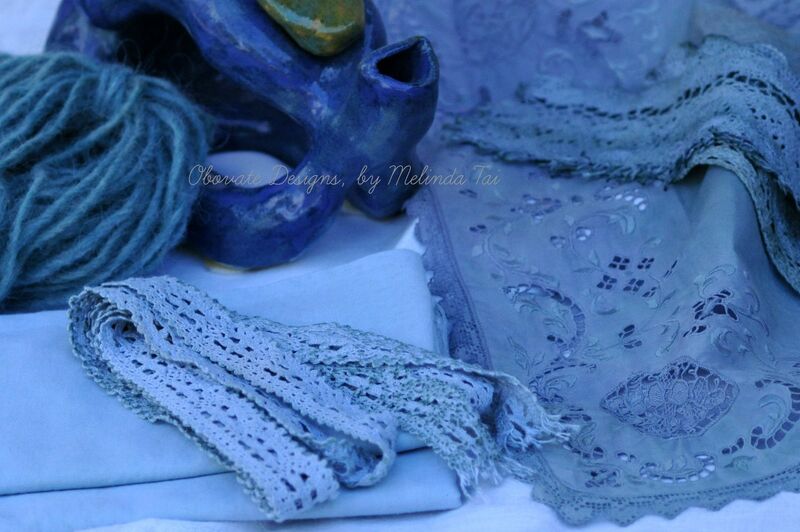 As I manipulated the samples, I could see they were turning to various shades of blue. 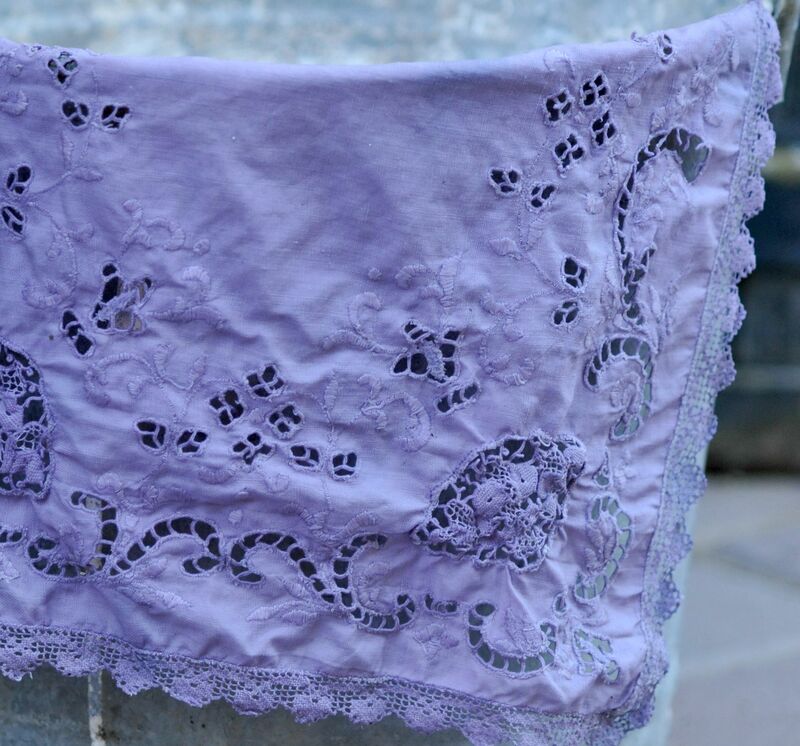 Results from second batch of cotton samples, washed in washing soda: here you can see the extreme color changes from white to bluish purple (fresh out of the pot). This was the highlight of my day! 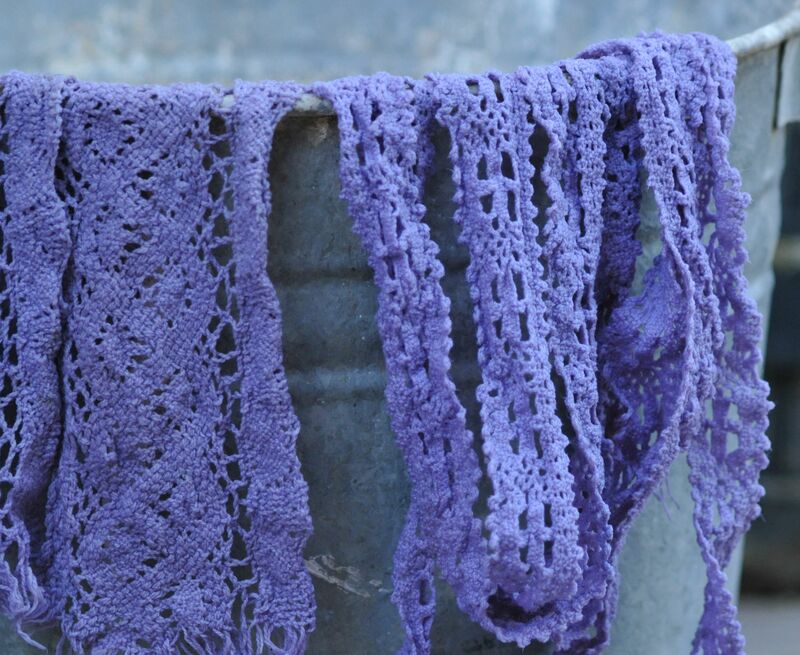 This is the concluding post of my dye experiment using tansy flowers. 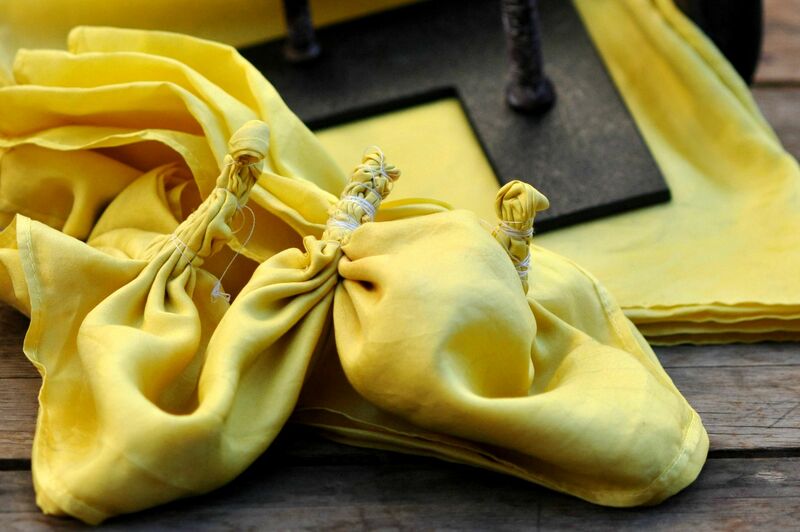 See my previous posts: “yellow from my dye pot, and mordant testing on tansy dye bath.” For this part of the experiment, I started with two silk scarves that were previously dyed yellow with tansy. 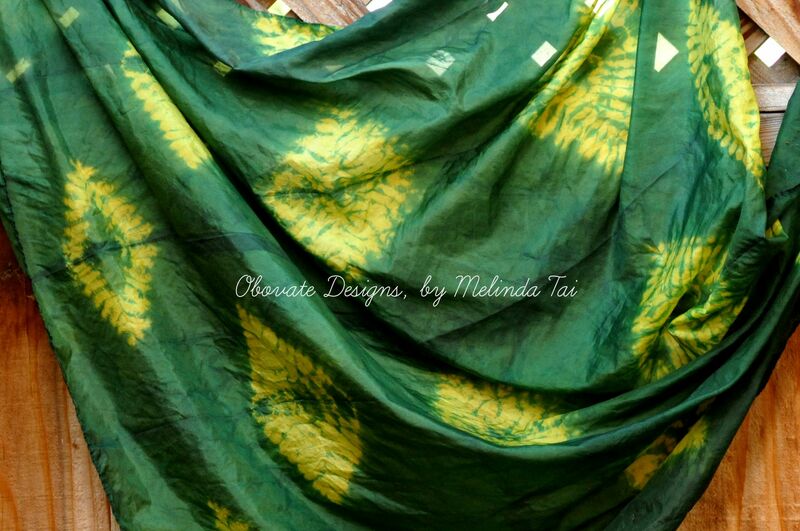 These scarves were then over-dyed with indigo, which resulted in a beautiful forest green background. 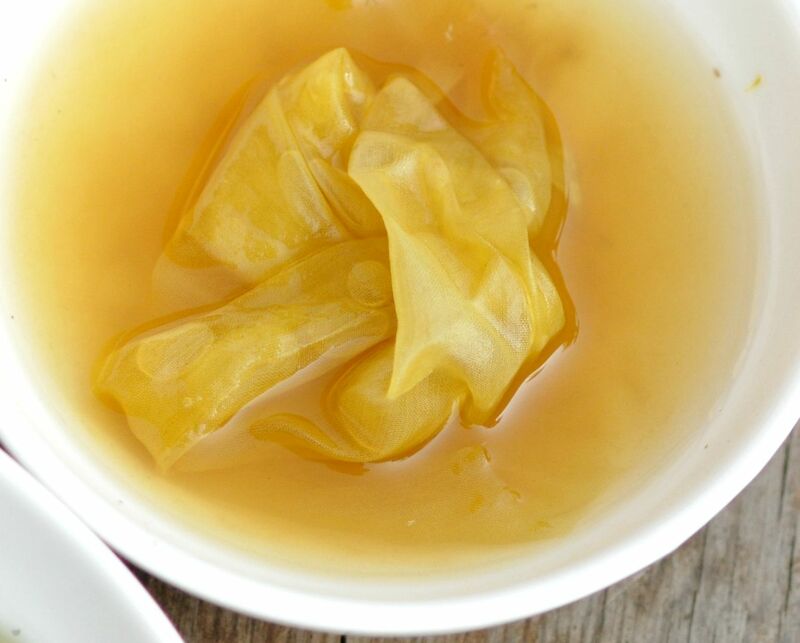 The yellow pattern is a result of using two different Shibori resist techniques (Nui, and Itajime) of folding, creasing, stitching and shaped resist-dyeing before dipping into the indigo vat. A brief description about the different techniques. 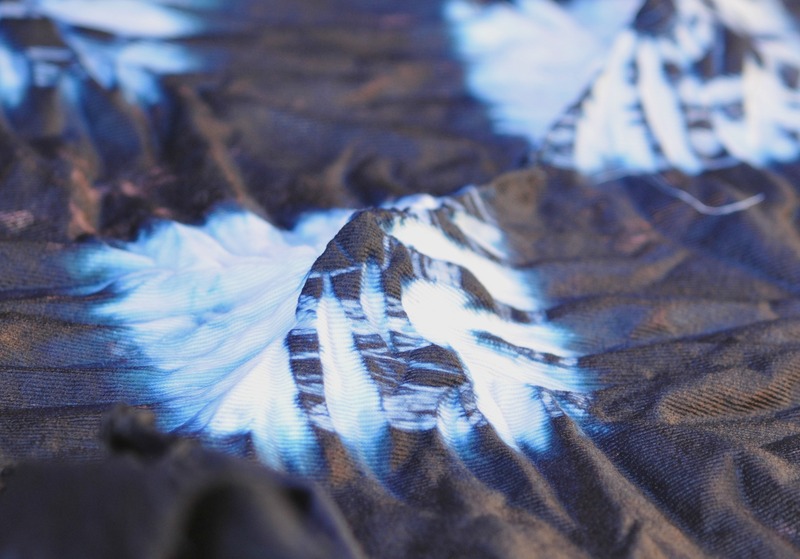 Nui Shibori designs are created by hand stitching in a straight, curved, or parallel lines on the fabric; the stitching is then drawn together and secured tightly before it is dyed. 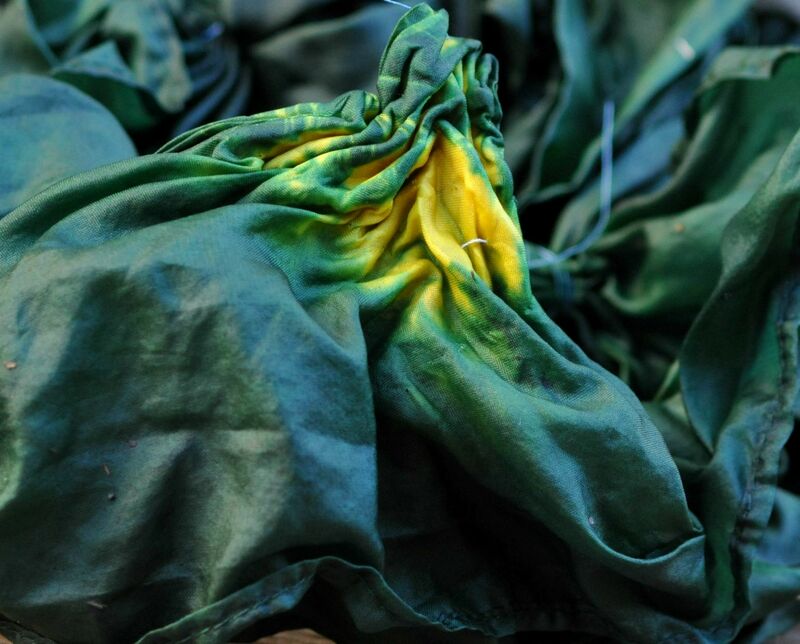 The folds and creases of cloth between the gathers form a resist from being dyed. This technique is a little time-consuming, but the end results are quite rewarding. 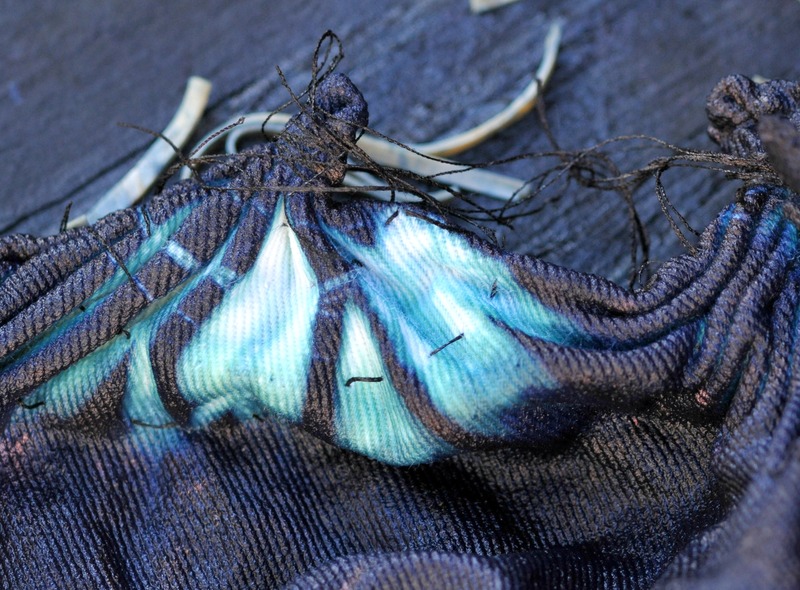 Itajime Shibori is a shaped resist-technique by sandwiching two pieces of wood or plastic templates between the folds of fabric. The stack is held in place by securing with strings or C-clamps. 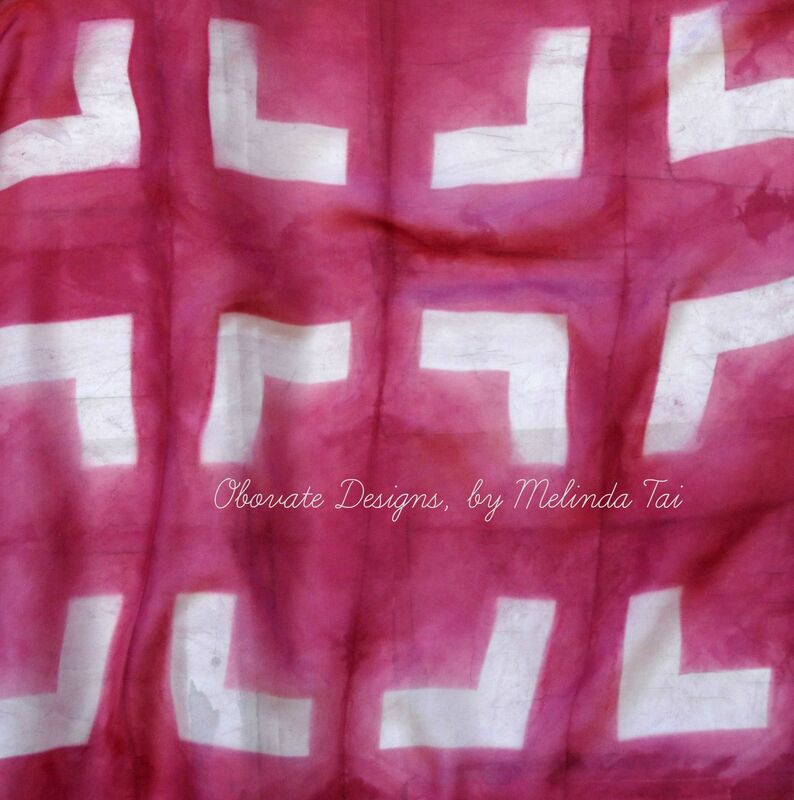 The shapes act as a resist and prevent the dye from penetrating the area that is covered by the templates. 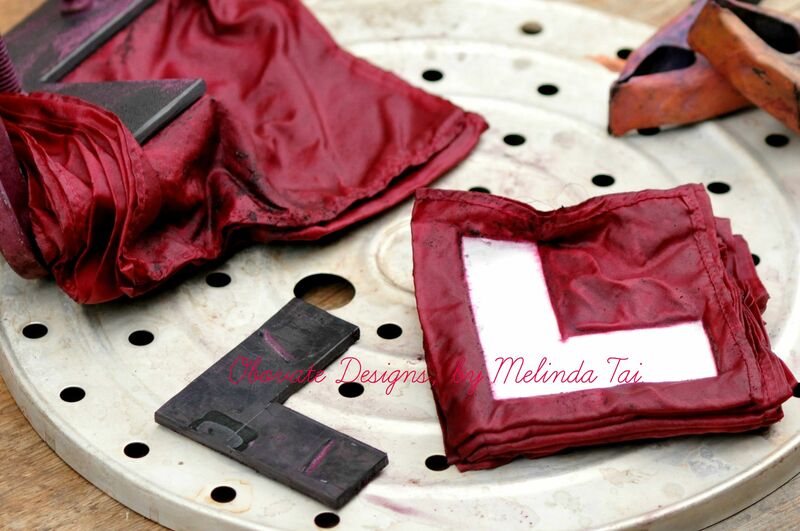 It is very important to make sure the top and bottom templates are in alignment with each other so that the exact shape of templates is transferred to the dyed fabric. 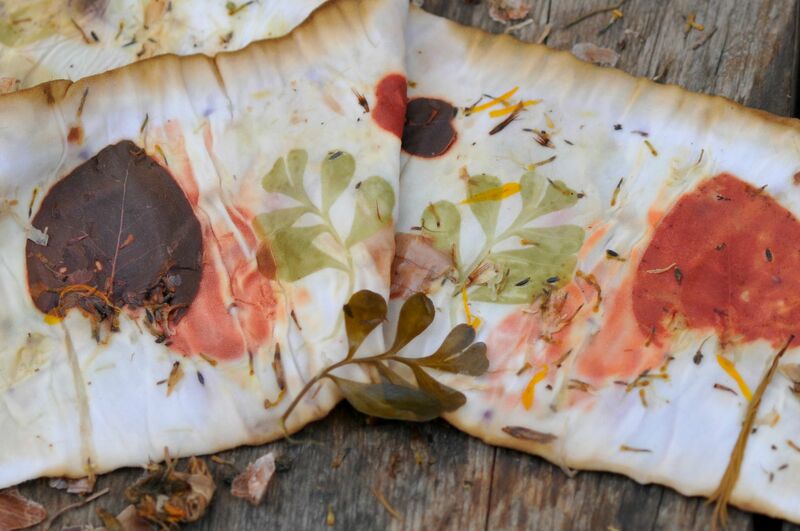 Following last week’s post, I was curious to find out what other colors and shades could be coaxed from the yellow dye bath by using different mordants. 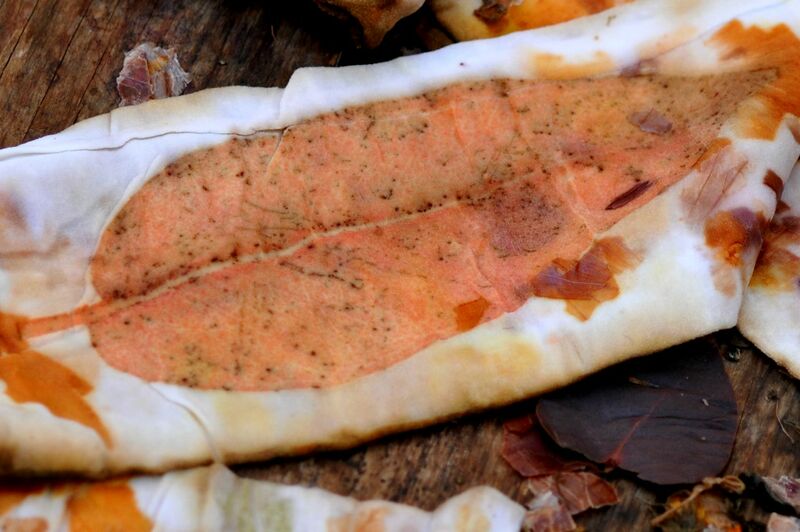 The word, mordant or mordre, literally means “to bite” in French . 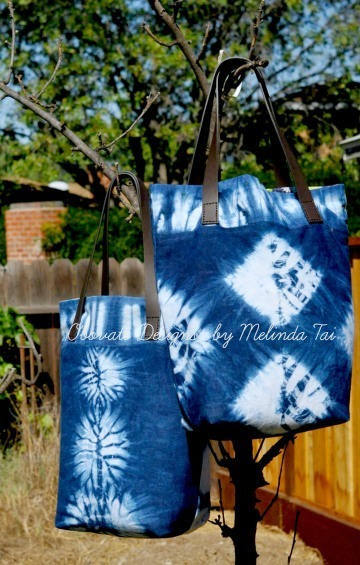 Thus, a mordant is a chemical that fixes a dye by combining with the natural dye pigment to form a permanent bond to the fiber. 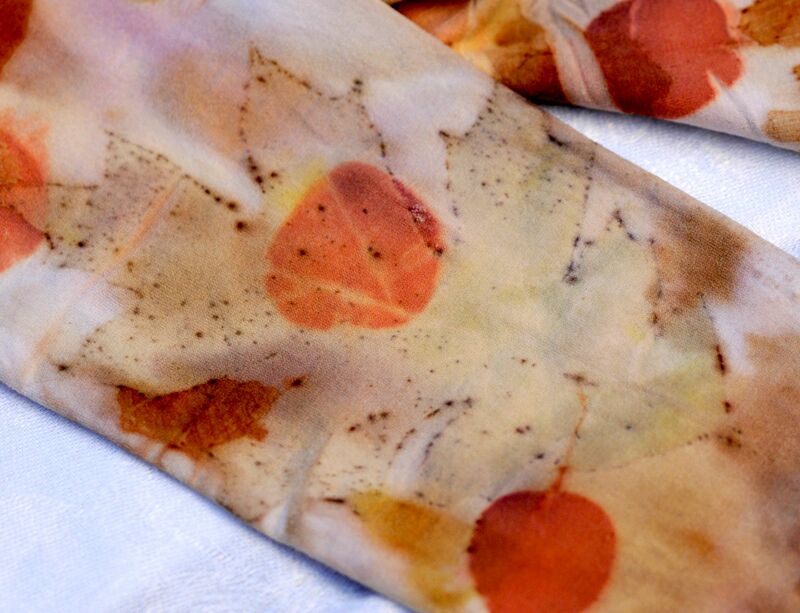 For this experiment, I used three different mordants: ammonia, iron, and alum with samples that were previously dyed in the tansy dye bath. 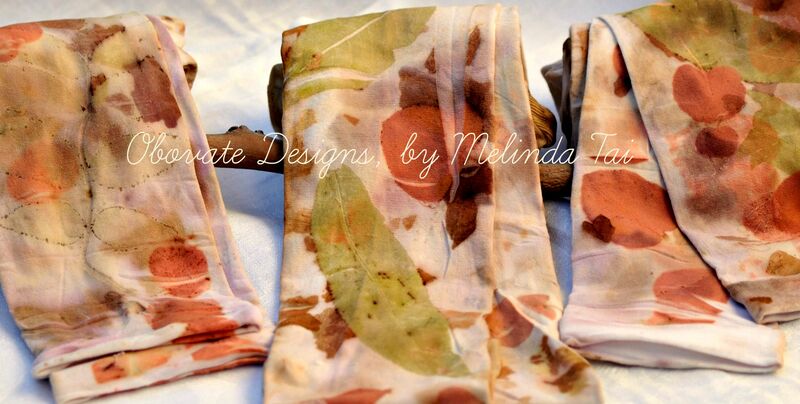 I was excited to see the different colors as a result of using different mordant/dye solution. I am happy with the results, and the photos below, document the process. more experiment about tansy on next post….thanks for viewing. 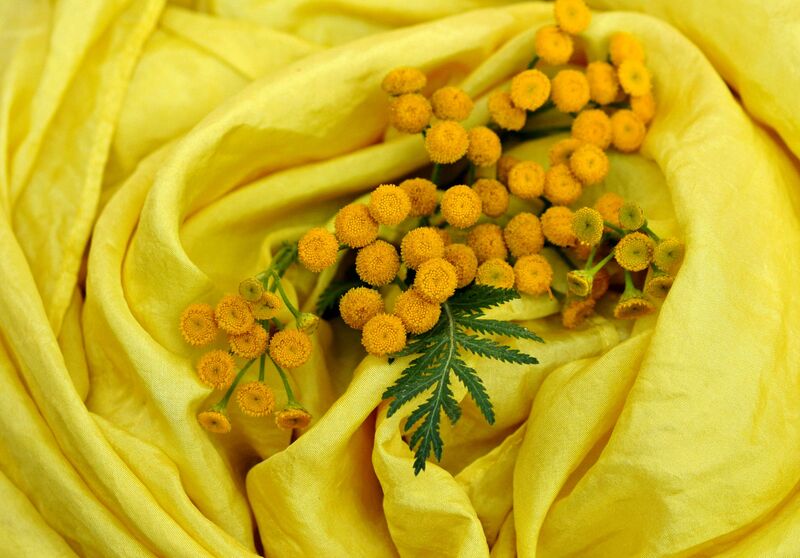 Tansy (Tanacetum vulgare), also known as golden buttons, bachelor’s buttons, or buttons of gold, is a tall green leafy perennial, bearing clusters of aromatic yellow round button-like flowers. 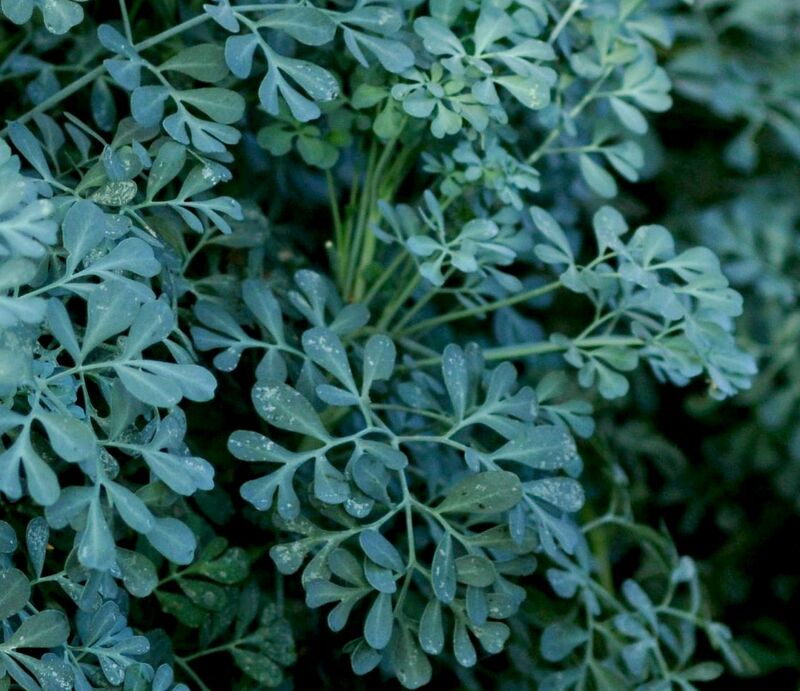 Unfortunately, this aromatic medicinal plant is considered invasive in some parts of the country. Despite, the fact that Tansy is an invasive weed, I was interested in growing this plant, as it is an excellent source of yellow dye. The flowers have an unusual scent, similar to that of camphor. A friend told me that she makes a tea from the flowers and stems to spray around the house to repel flies, ants and mosquitoes. 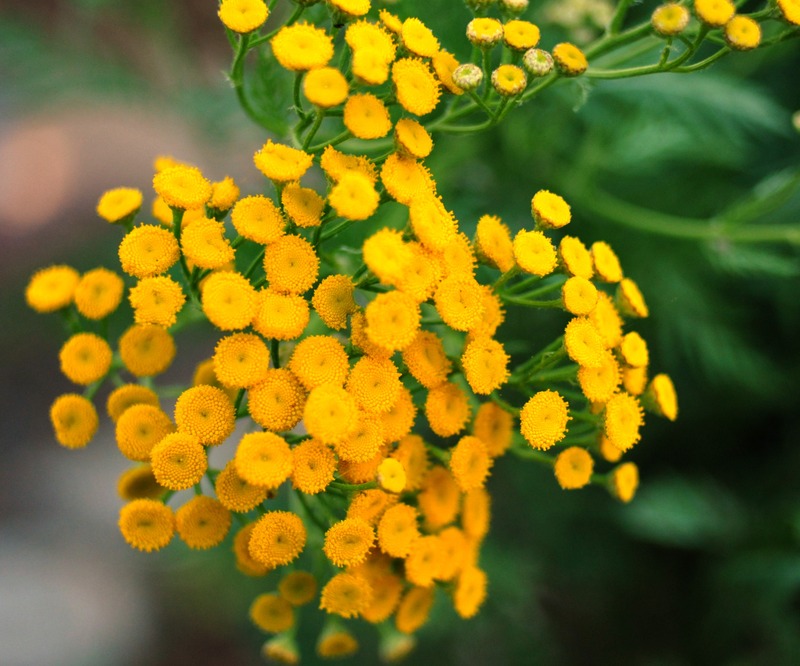 Tansy, besides being a natural repellent, was also been used for medicinal purposes and in companion gardening with certain crops to repel bugs and insects. My tansy plant has grown tall and is in full bloom, the stems are heavy with the flowers, that are drooping to the ground. This morning, I had to cut most of the foliage and harvested a basketful of flowers; tied them in bunches and hung them up to dry in the shed. I kept a handful of fresh flowers for today’s simple experiment. First, I cut up the flower tops and simmered them in a pot with water and boiled them for about an hour. 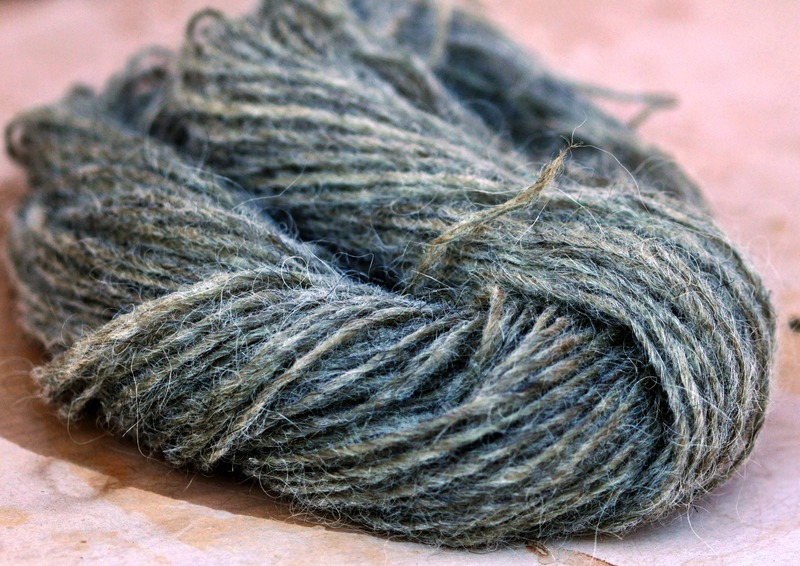 I then placed some pre-mordant silk fabric in the pot and let it simmer in the pot for another hour or so. 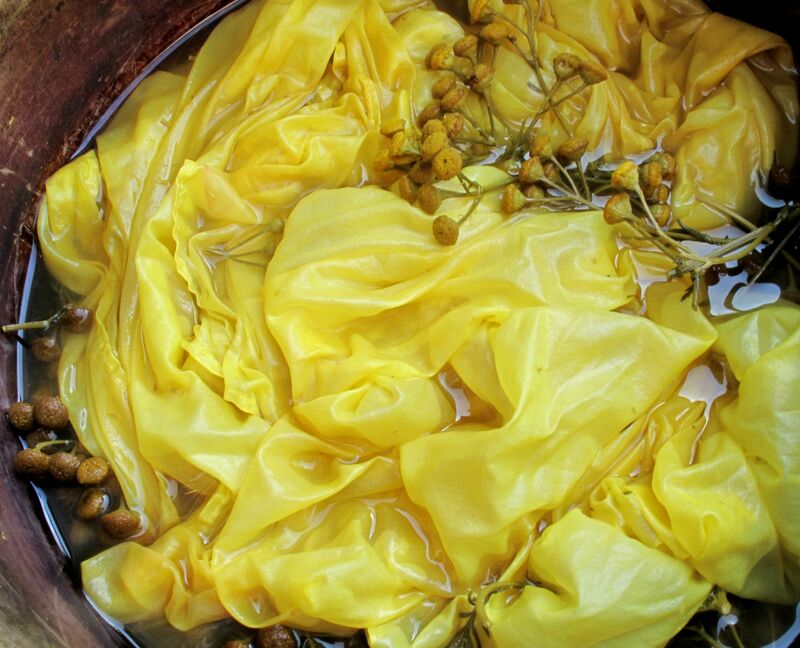 The fabric is now an intense yellow shade after only an hour of simmering. I’ll be completing my experiment later this week, drop by to see the final results. Laccifer or Kerria Lacca or Lac is a parasitic scale bug that feeds on the sap of certain tropical trees and secretes a sticky resin. 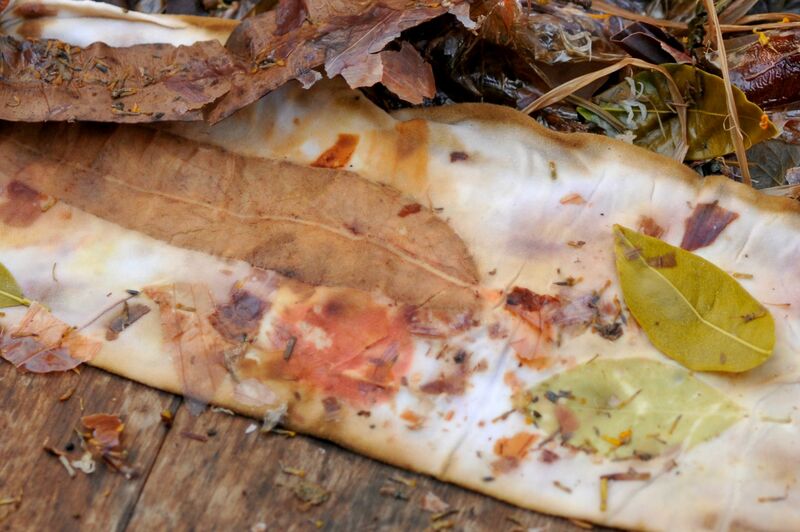 The resin-like secretion hardens when exposed to air; it forms a protective crust around the insect as it dines on its host plant. 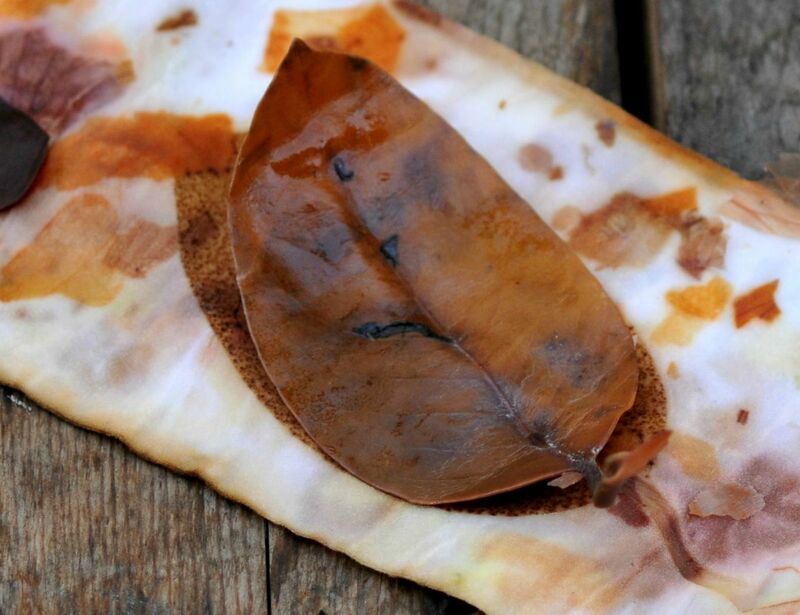 The twigs of are cut down from the tree in order to harvest the crust. 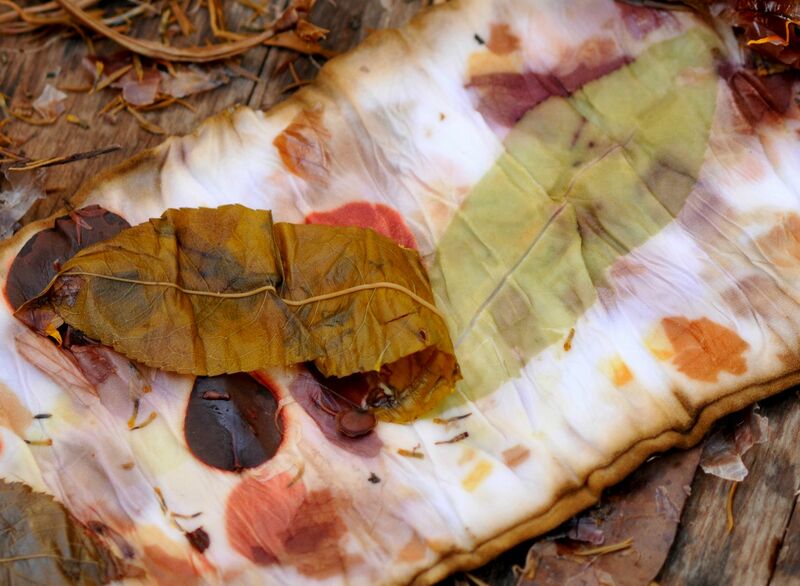 This is called stick lac and consist of two components, the resin and the dye. 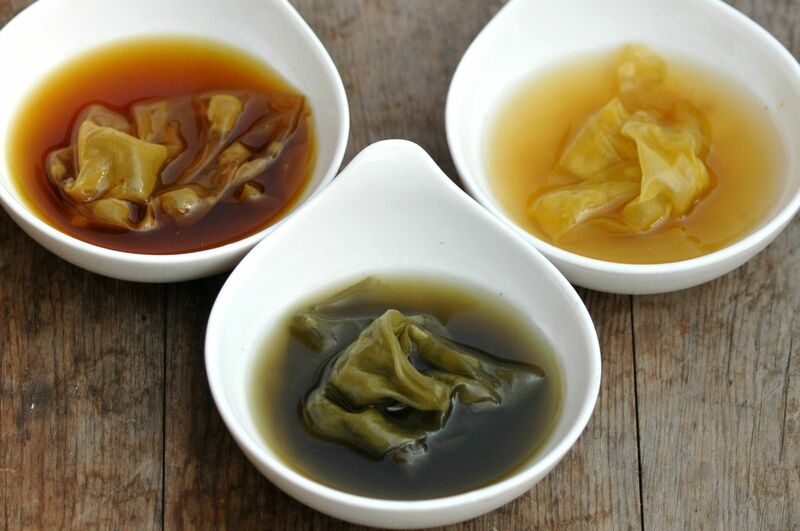 Shellac is made from the resin, which is used in food, cosmetics, and clothing industries. 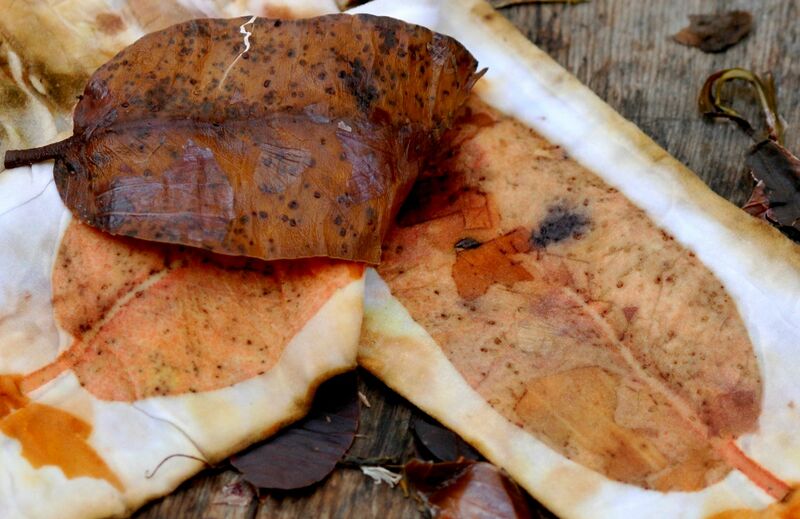 The dye component is colorants extracted from the resin and is used for dyeing. 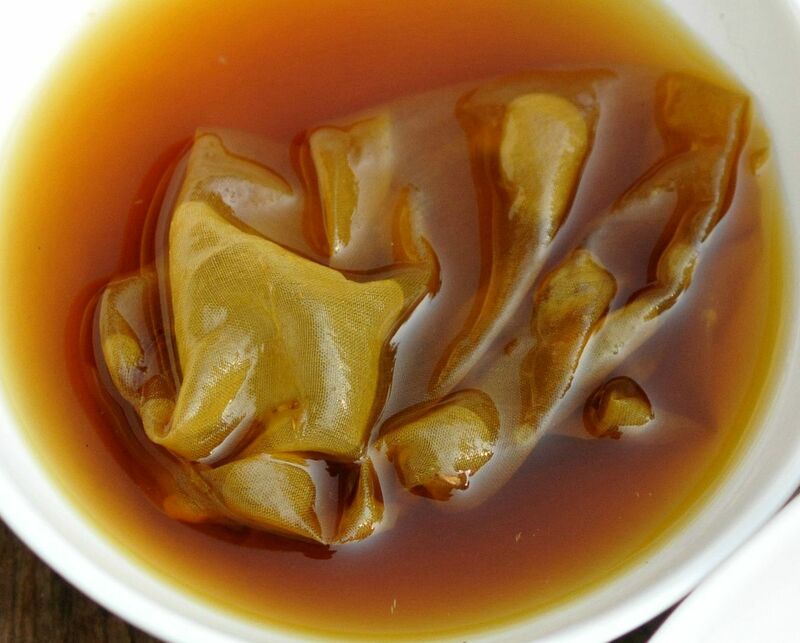 India and Thailand are currently the largest producers and exporters of lac extract. 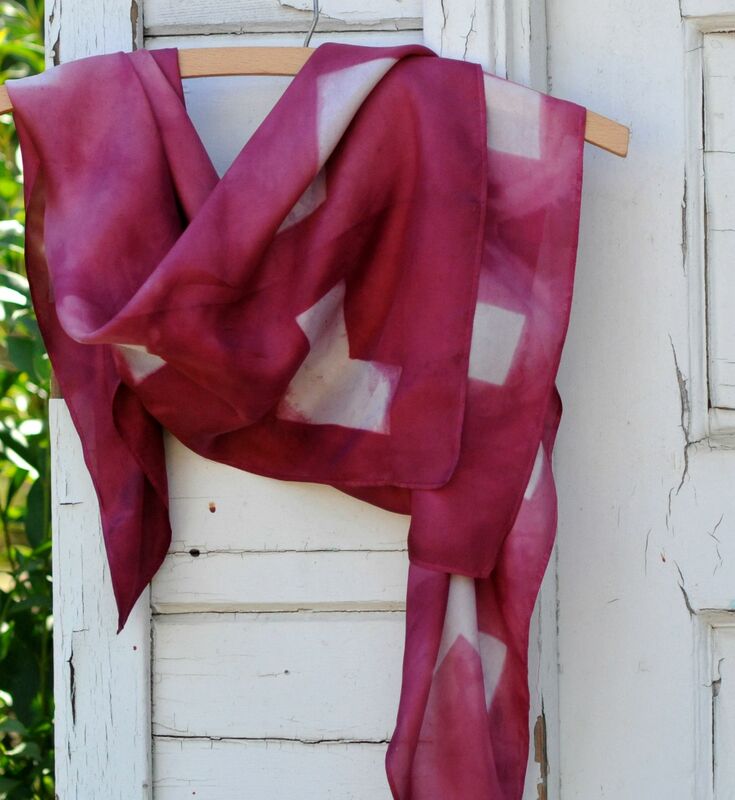 Lac is quite similar to the Cochineal scale bug that produces a dye colorants in shades of crimson, red to burgundy, violet and brown. 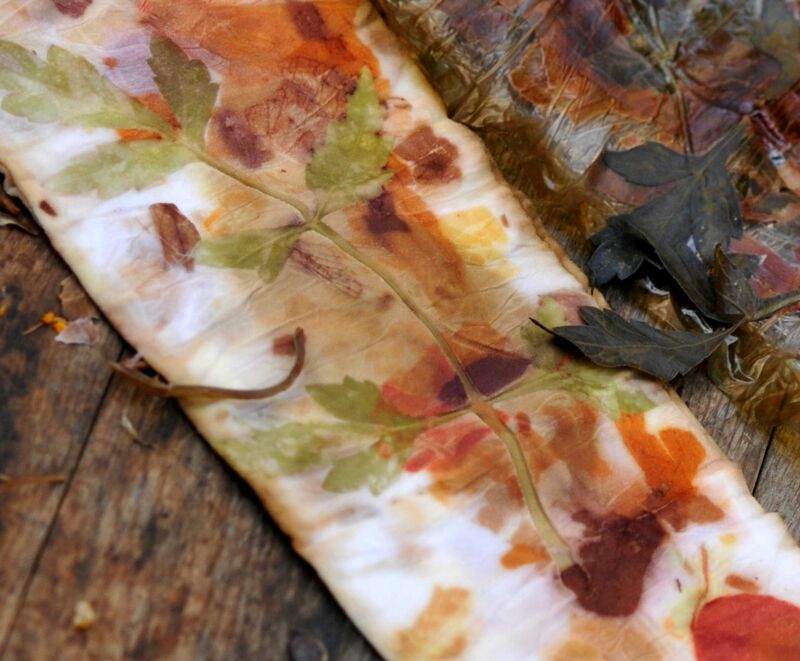 These color variations are predicated and modified by appropriate choice of mordant used in the dye bath. 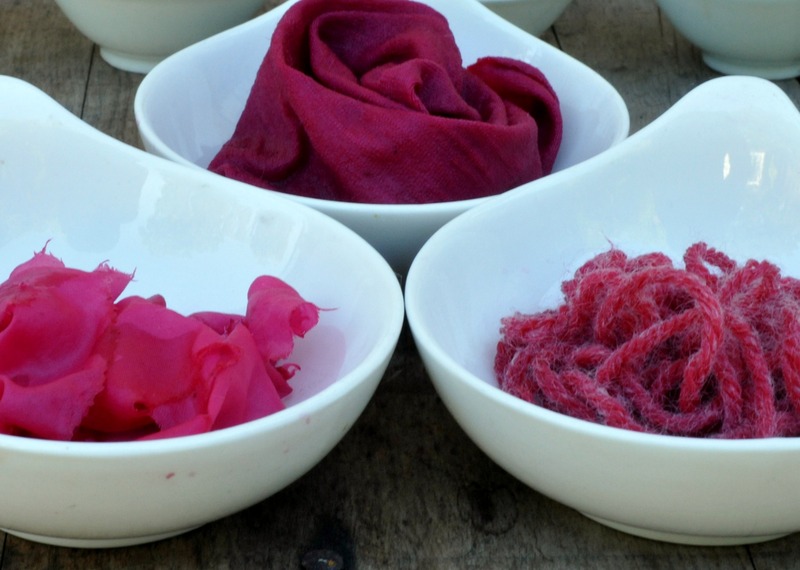 Unlike cochineal, the price for lac dye is relatively affordable compared to the former. With all the characteristics about this wonderful bug, I was interested to find out the different colors it yields and if the color is colorfast. 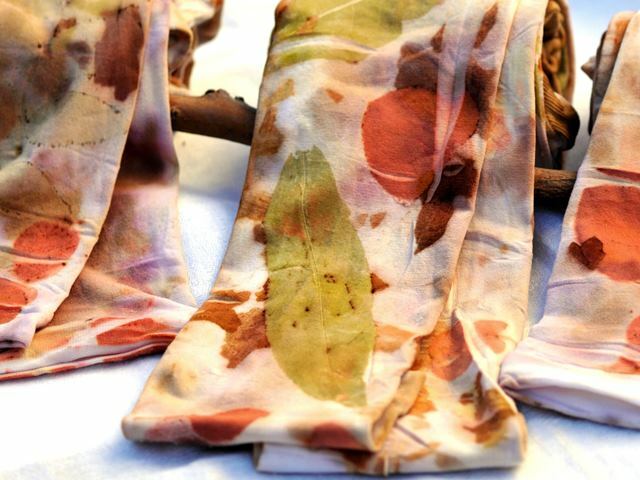 In this post, I hand dyed these silk scarves using a Japanese technique, called Itajime shibori. 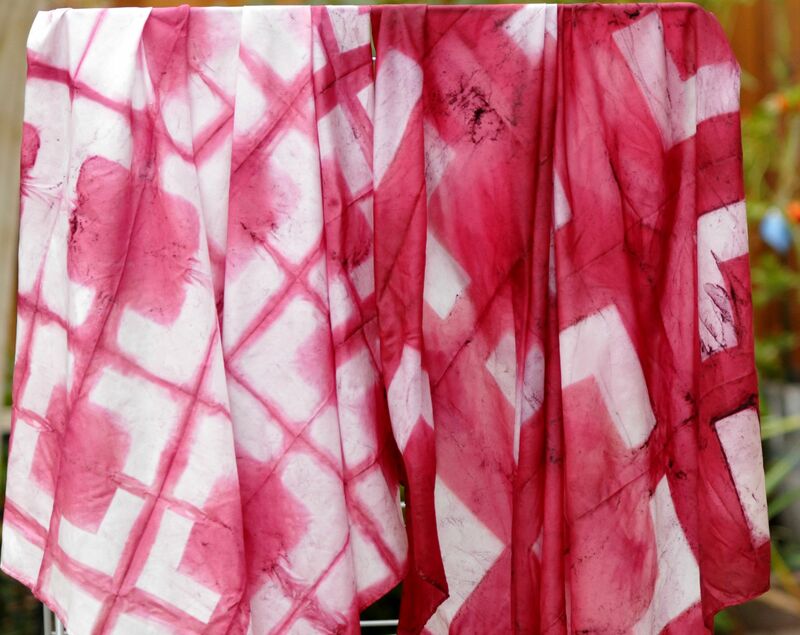 Shibori is Japanese for shaped resist-dyeing using different cut shapes of circles, triangles, and squares. John cut me a set of L-shaped design from ABS plastic. 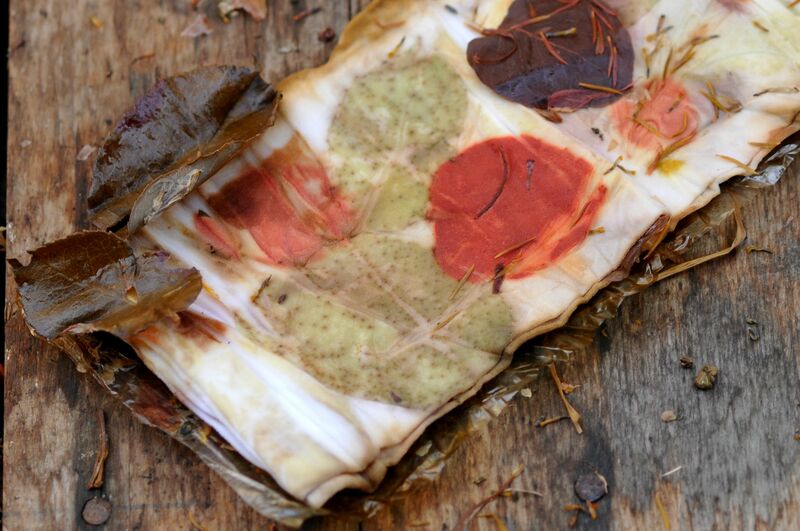 I folded the fabric into a bundle and sandwiched between two plastic shapes; secured the bundle with C-clamps and placed the bundles into the lac and alum dye bath. I am happy with the results, and the photos below, document the process. 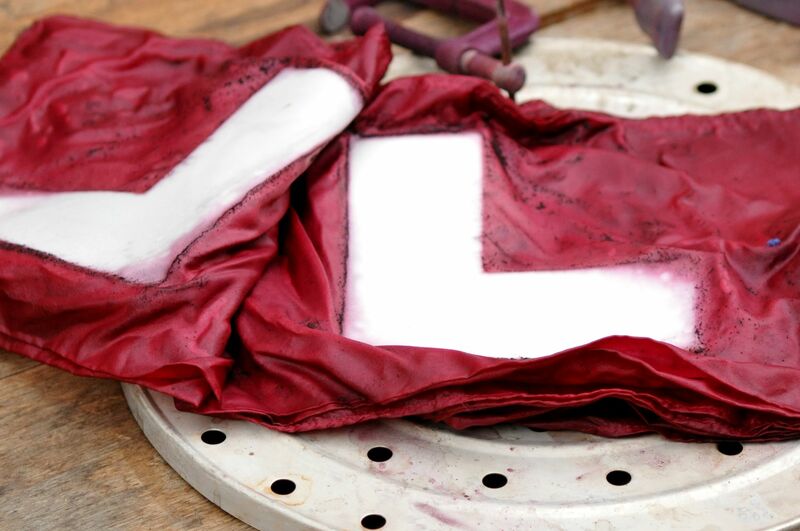 a beautiful twosome in scarlet red and burgundy, still has specks of lac on wet fabric. I had a few days off from work this week. 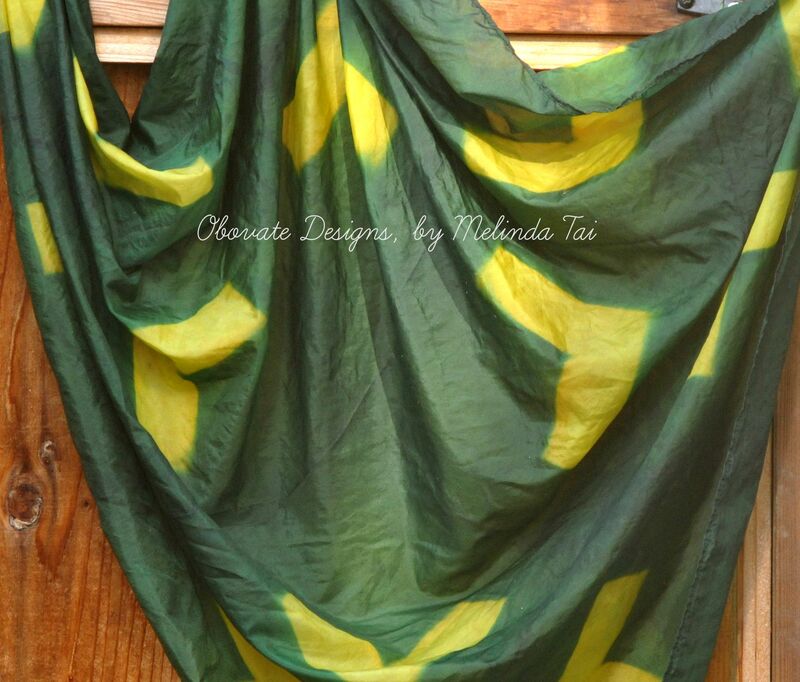 This gave me the opportunity to catch up on my list of “PHD” sewing and dyeing projects. By the way, the acronym for P.H.D, is piled high and deep. 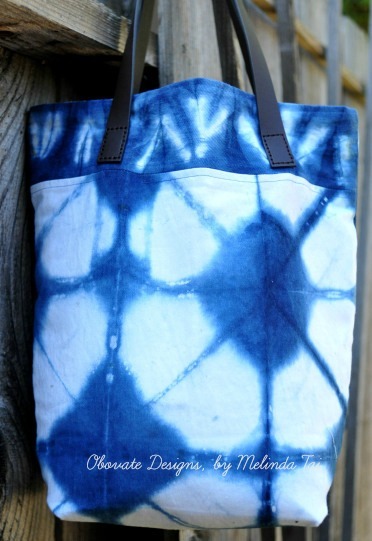 I made these tote bags using Shibori folded, stitched and clamped-resist techniques and then dyed them in indigo dye vat. 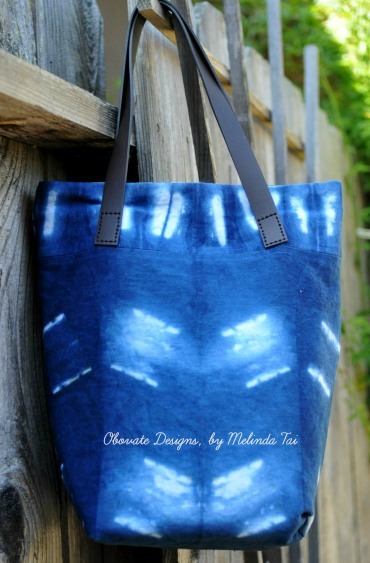 I love the deep and rich blues of indigo dyes. 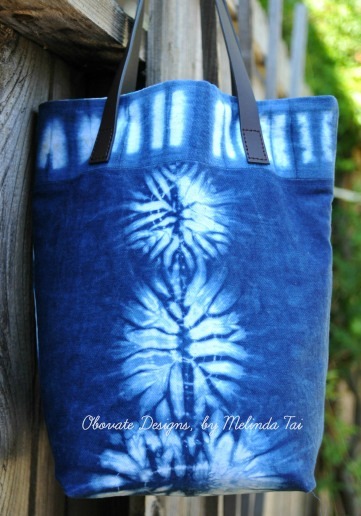 Indigo dyed denim tote bags made with Nui and Itajime Shibori techniques. 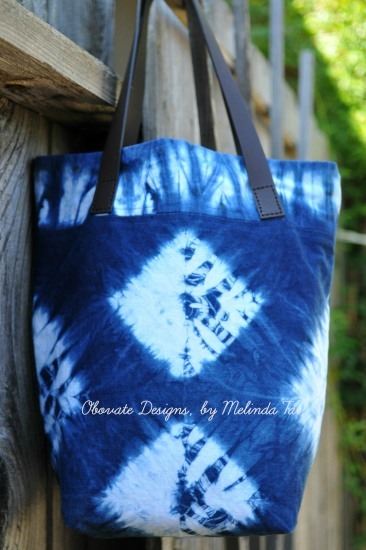 This tote bag is available for sale here. 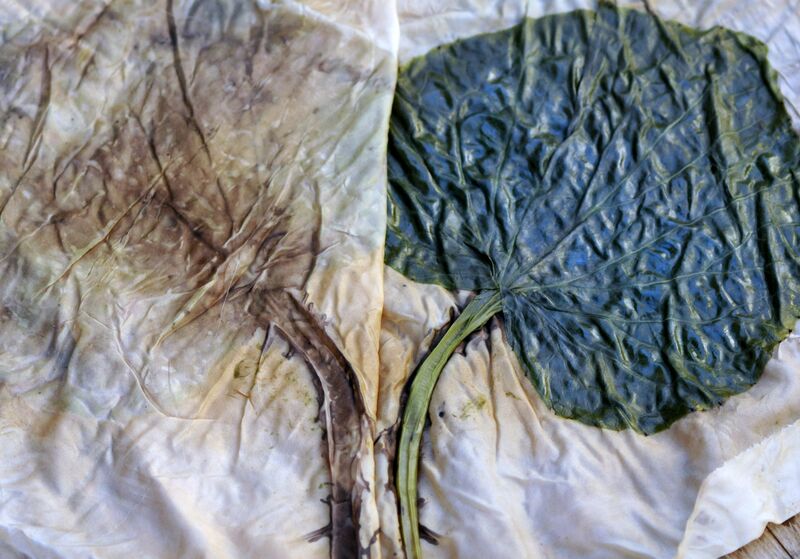 Wabi Sabi is a Japanese term to define the simplest art of finding beauty and grace in the nature of imperfection; and acceptance of the cycle of life and death. It has nothing to do with Wasabi, but I like the ring to it. A few weeks ago, I made a promise with the owner of our favorite Japanese restaurant to trade a Wasabi plant for a Myoga ginger (Zingiber Mioga) plant that he has growing in his garden. Myoga ginger plant is grown for its young and tender flower buds, and is eaten as a garnish with sushi. 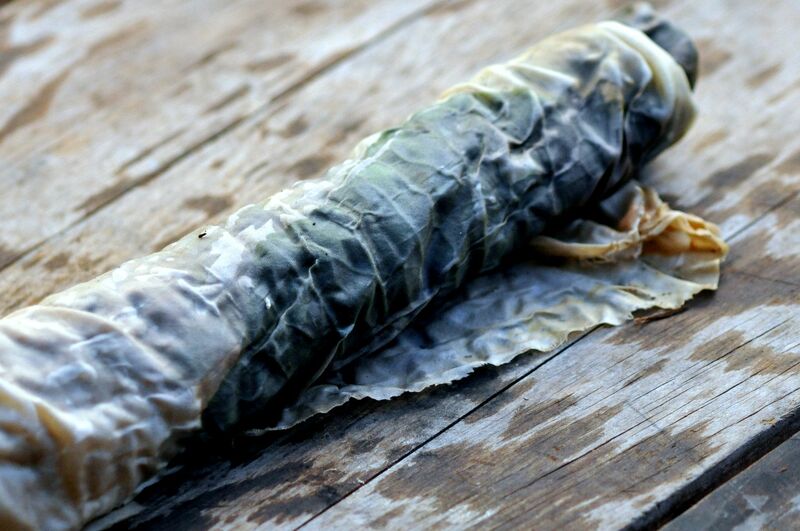 Just like Wasabi, it is another ingredient that are quintessential to Japanese cuisine. With some luck, I found a farm up in Oregon that grows and ships Wasabi plants. I bought two from them–one for myself and the other for the Japanese owner. I was so excited when I received the package, and I planted it in a shady spot. I hope it will do well in our garden. Wasabi (Wasabia japonica) is a herbaceous perennial that is native to Japan’s northern islands, for its cool mountain streams and shaded woodlands. 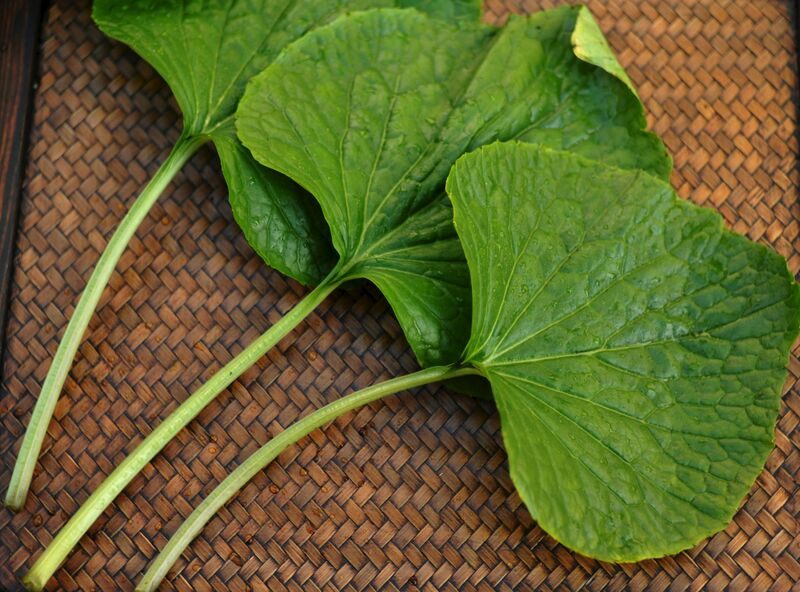 Wasabi belongs to the family Brassicaceae, which includes broccoli and cabbage. 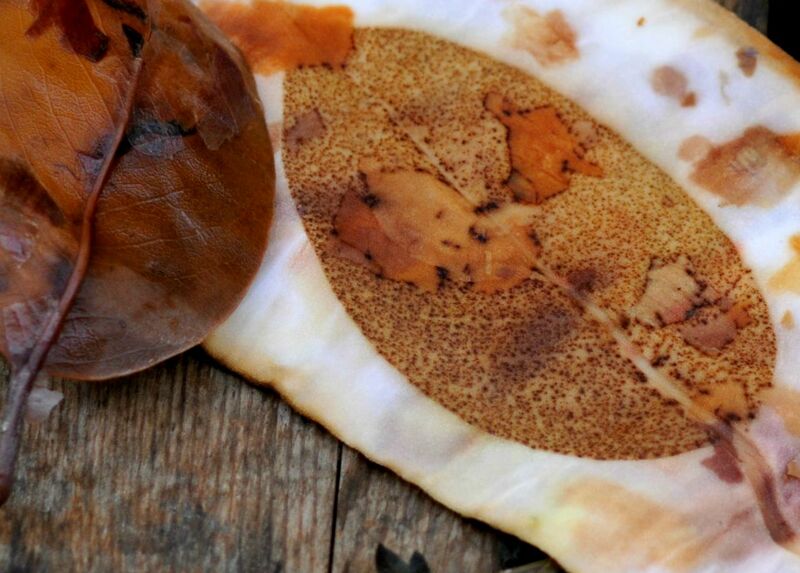 It has antibacterial compounds that make it an idea condiment for Japanese cuisine. 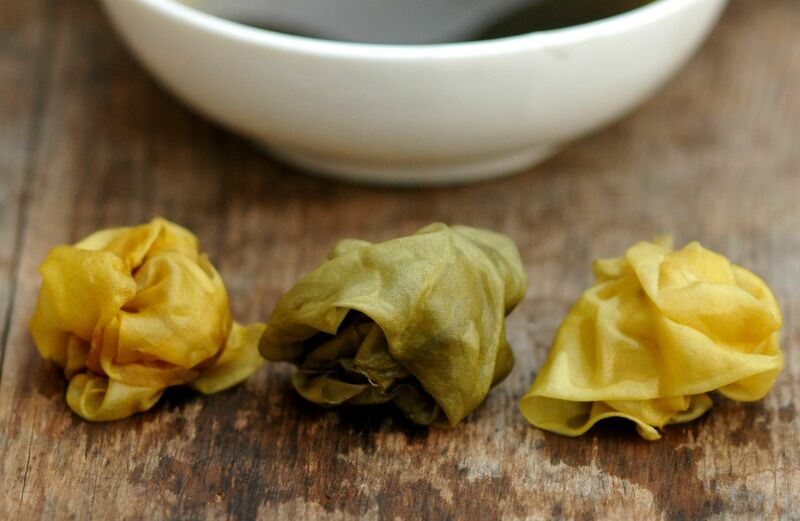 The tuberous rhizome is grated to make a green aromatic paste that has a distinct and earthy flavor and without a lingering, and burning aftertaste like the artificial Wasabi that makes your nose flare up like fire. 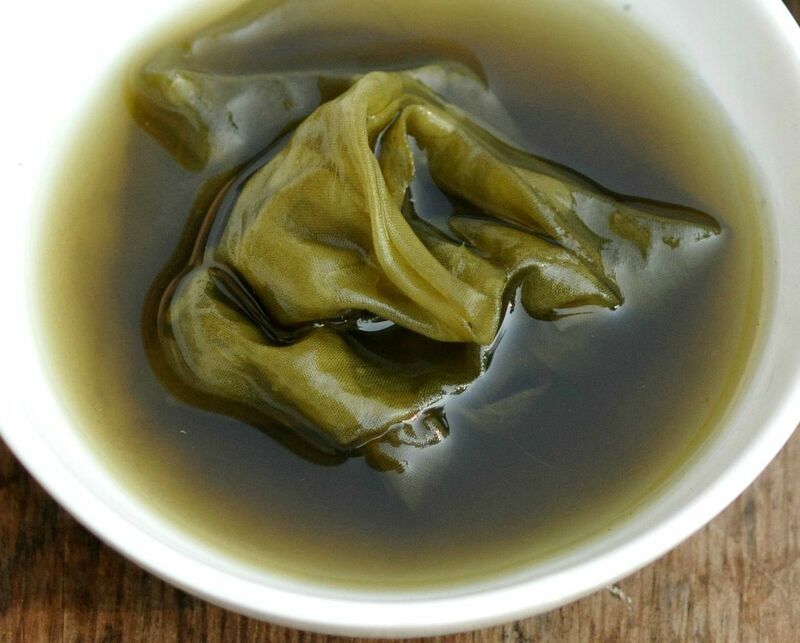 The Wasabi that you find in most Japanese establishment and grocery stores are made with a concoction of horseradish, coloring, and other preservatives. The wonderful thing about the Wasabi plant is that all parts of the plant (rhizomes, leaf, stem, and flowers) are edible. 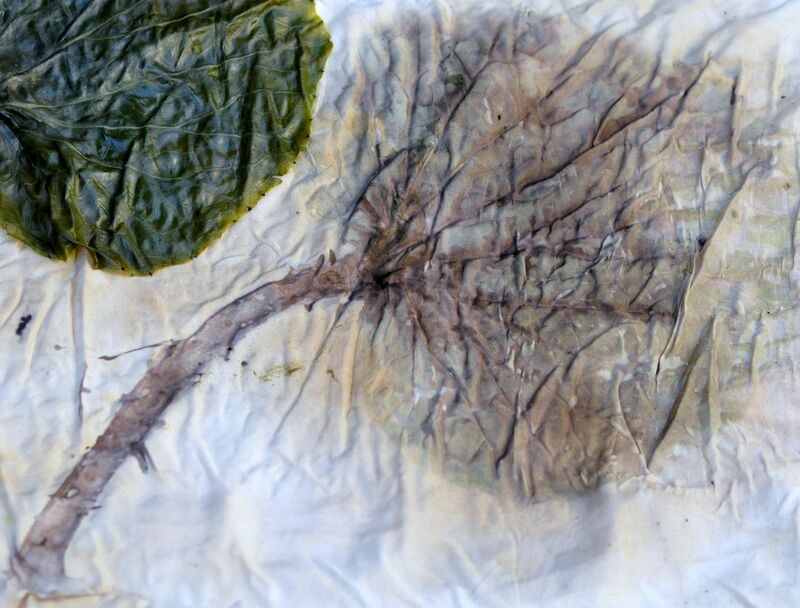 With all the characteristics about this plant, I was interested to find out if the plant is a good source for contact printing. 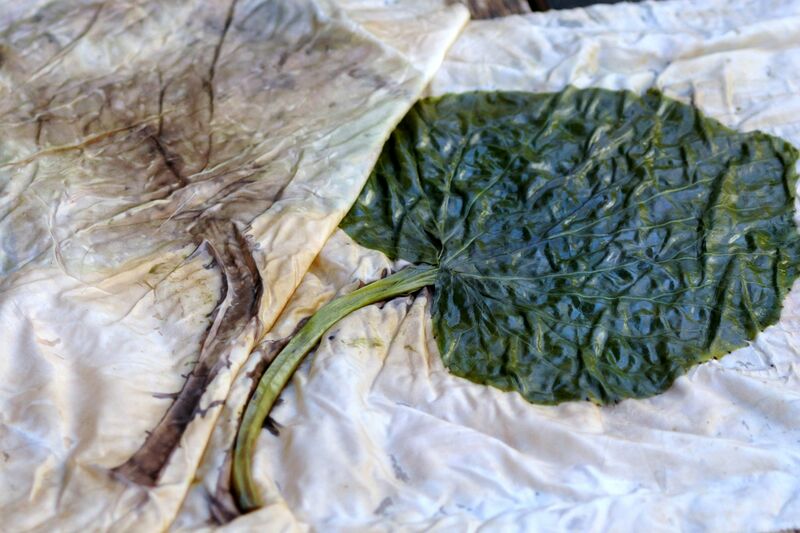 I’d tried a few experiments with the heart-shaped leaf by steaming it on watercolor paper; bundled the leaf in a silk fabric and boiled in water with iron solution. I was happy with the results and the photos below, document the process. I am glad to share the results. 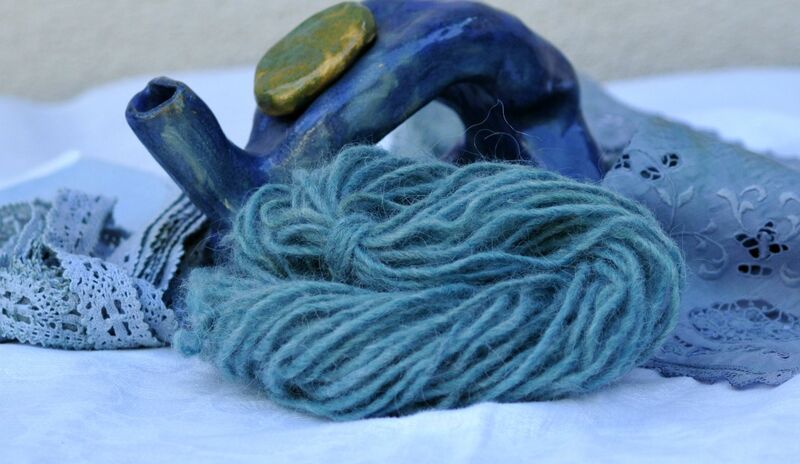 Clockwise: merino silk; wool yarn; silk. 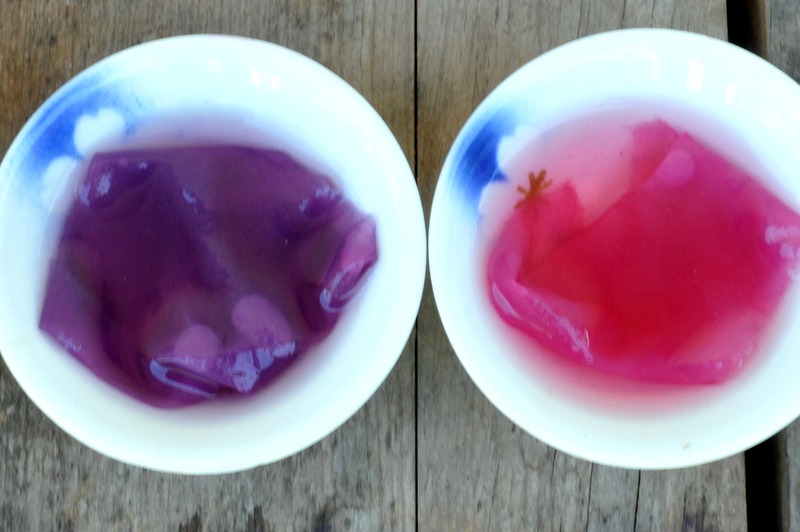 These samples were simply soaked in the dye solution. 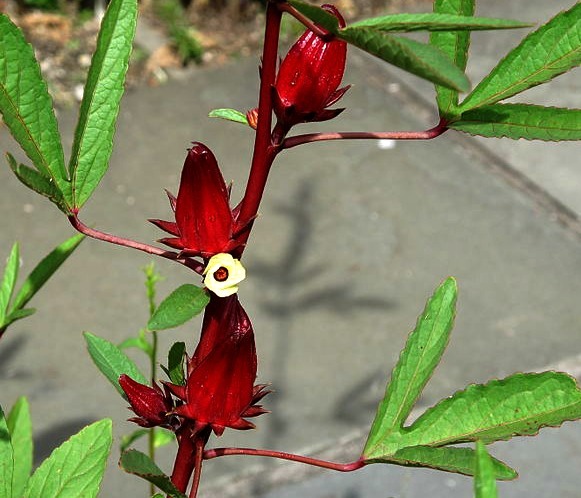 Roselle (Hibiscus sabdariffa) is commonly known as wild hibiscus. It is a tropical plant with yellow flowers. I remember in my childhood days, my mother used to make a syrupy drink from the dried fruits, and she told me it was Ribena. Rosella and Ribena are similar in color and taste, but they are two different fruits. The true Ribena syrup is imported from the U.K, and is made from black currant which is rich in vitamin C. It is a sweet and slightly tart drink and it’s great to quench your thirst on a warm day. It was a treat when my mother served us a Ribena drink. Earlier this year, I was on vacation for a month in Kuala Lumpur, Malaysia. While I was there, I never missed my daily routine to the local wet market for breakfast. I love to visit the different food stalls stocked with an array of fresh and colorful produce for sale. What I love most was the interaction with the local farmers, and bargaining with the vendors. It makes me feel so much at home. One day, while I was eating breakfast at a noodle stall, I heard someone calling out “Ribena for sale.” I was puzzled when I heard the familiar word. I hurried and finished my noodle; got up and walked in the direction of the voice. There in the corner near the butcher stall, was an older woman selling dried Rosella. What a lovely coincidence–I walked over to her and bought all of it. She was taken aback and asked me in Chinese, “Why I want so much?”, I told her that I want to make a drink with it. She gave me a wide and toothless smile. I still remember the look on her face, it gave me such joy knowing I had bought all she had and she could go home early. 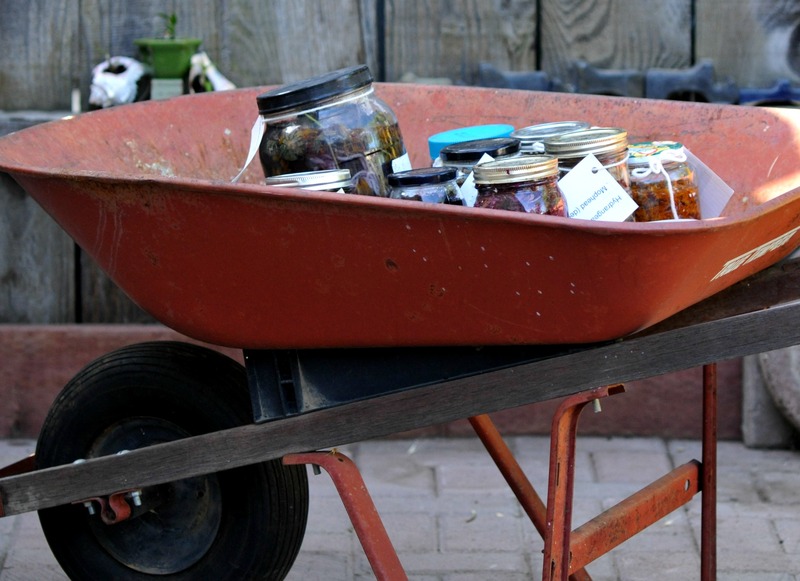 She probably struggles each day to make a living selling a few herbs from her garden. 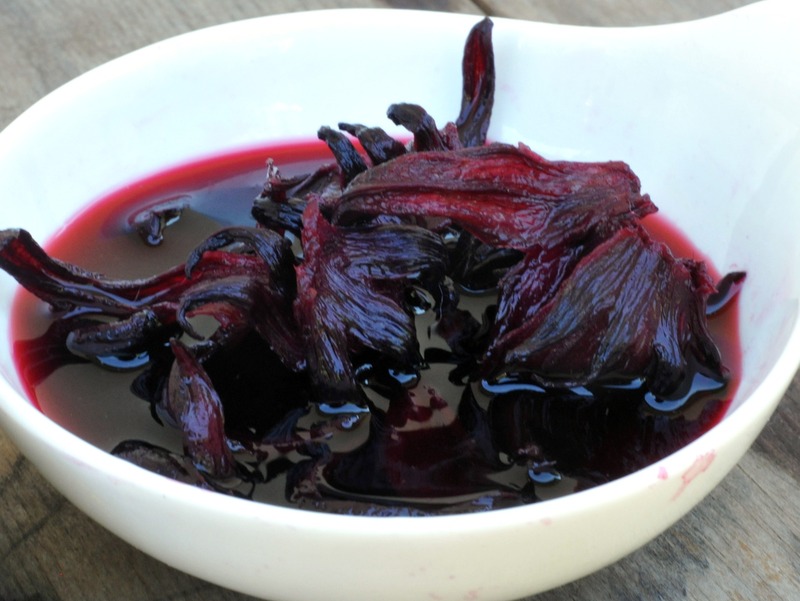 In this post, I am doing two experiments: 1) Can I extract a useable dye from the dried calyx of the rosella plant. 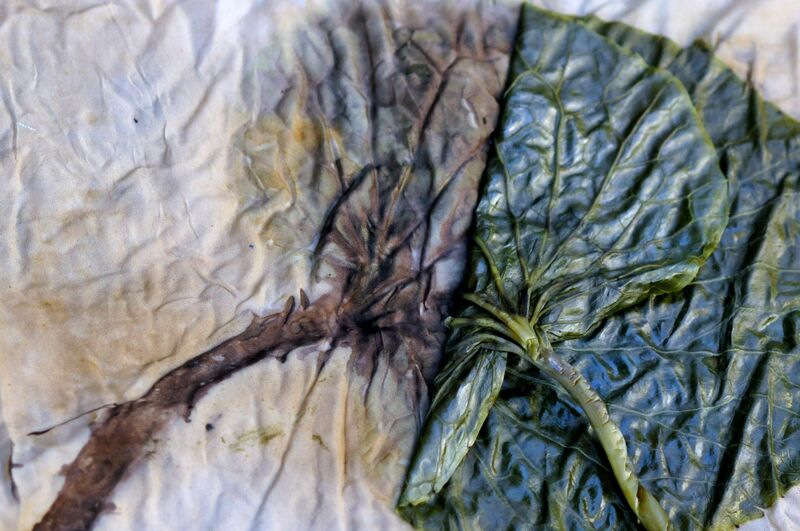 2) Does different mordant solutions impact the resulting final color. 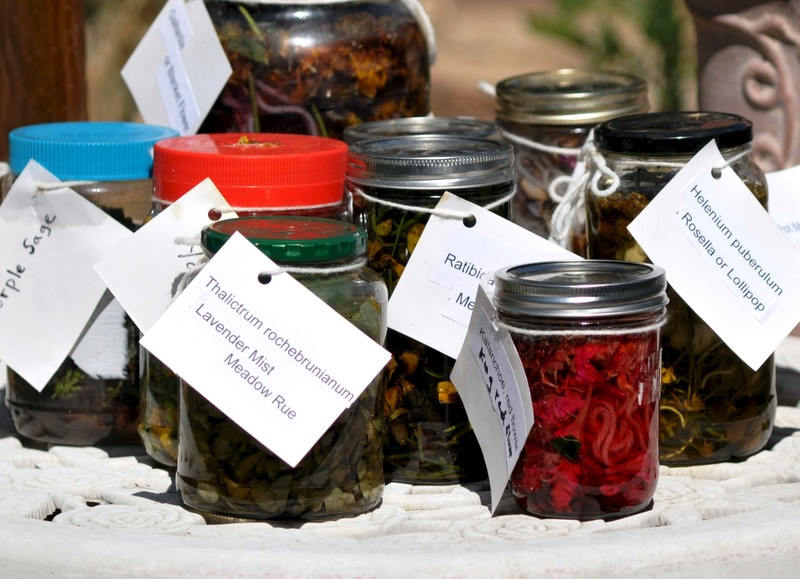 I started by steeping a handful of dried rosella, some wool fabric, yarn and silk fabric in a mason jar filled with water (see my earlier post on solar dyes plain and simple ). The next day the water had turned to a deep burgundy red color. 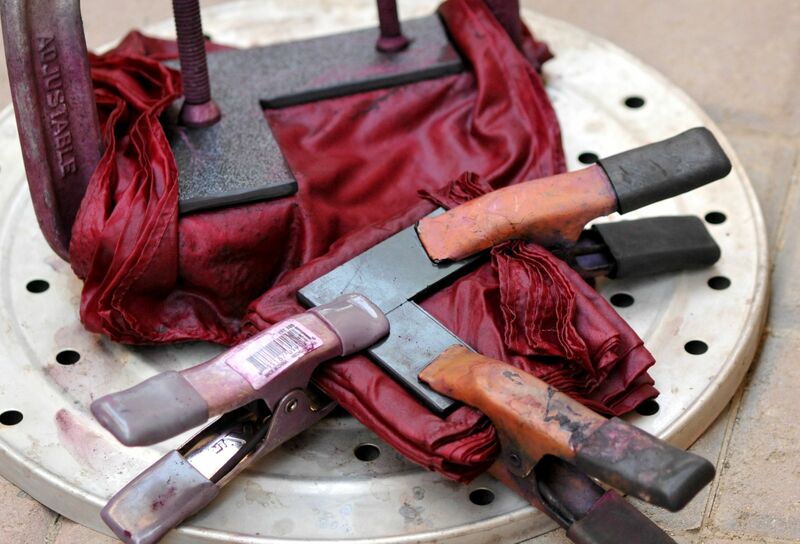 I removed the wool and silk samples from the jar and they had all turned a deep crimson to burgundy red color. 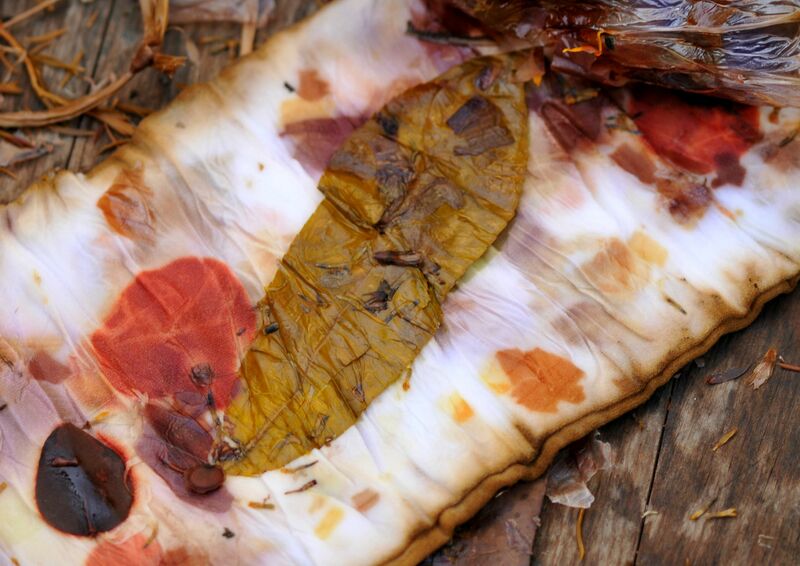 My first experiment showed that I could extract a useable dye from the dried rosella. 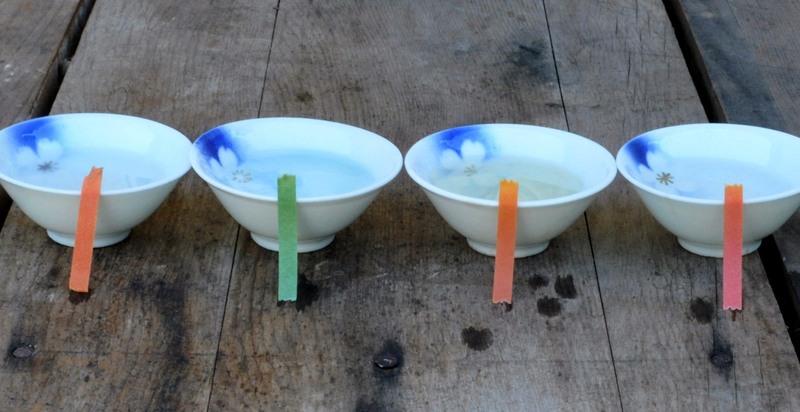 For the second experiment, I set out four small bowls of water, I then put a different mordant ( about a pinch or a few drops) in each of the bowls the in the following order: aluminum sulfate, sodium bicarbonate, ferrous sulfate (iron), and vinegar. 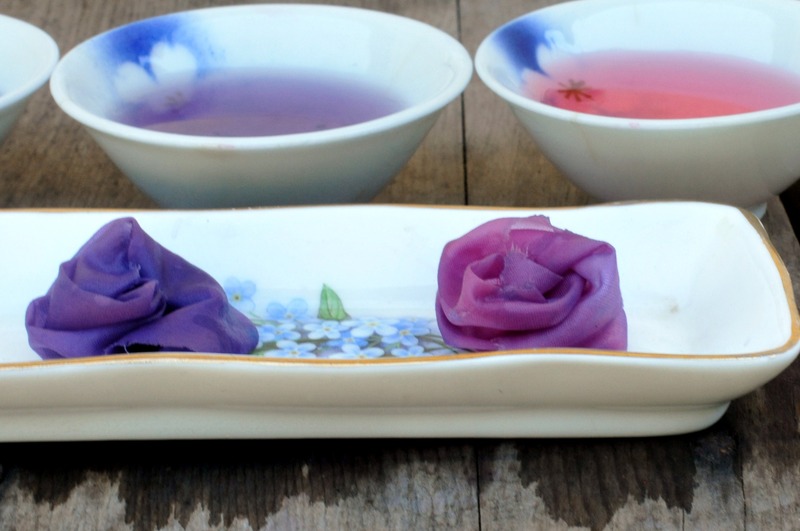 Then I dipped a strip of pH test paper into each of the bowls filled with the mordant solution. The results below show the pH measurement for each of the solution: pH 4 for alum; pH 7 for baking soda; pH 4 for iron; and pH 2 for vinegar. 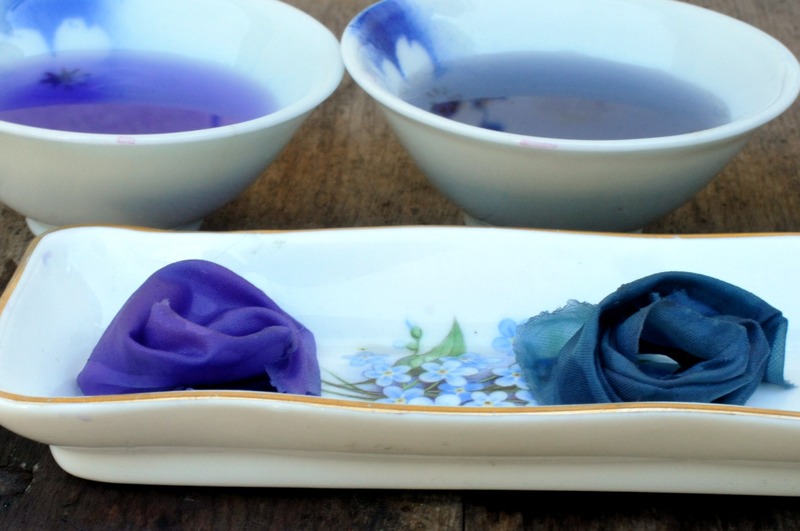 Next, I place my samples of pre-dyed silk fabric into each bowl of solution. 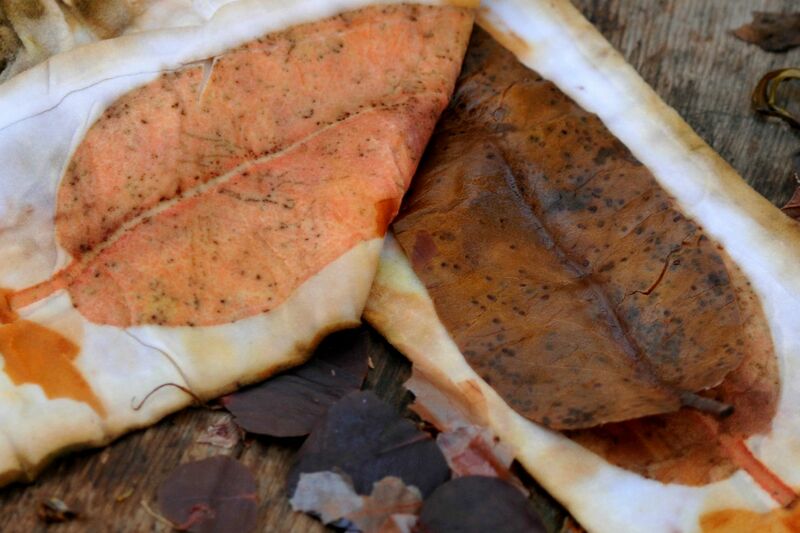 Here is the fun part and the pictures below are evidence that the resulting dye color is quite dependent on the type of mordant that was used. Using the pH paper allows me to estimate whether I have made too strong or weak of a solution. 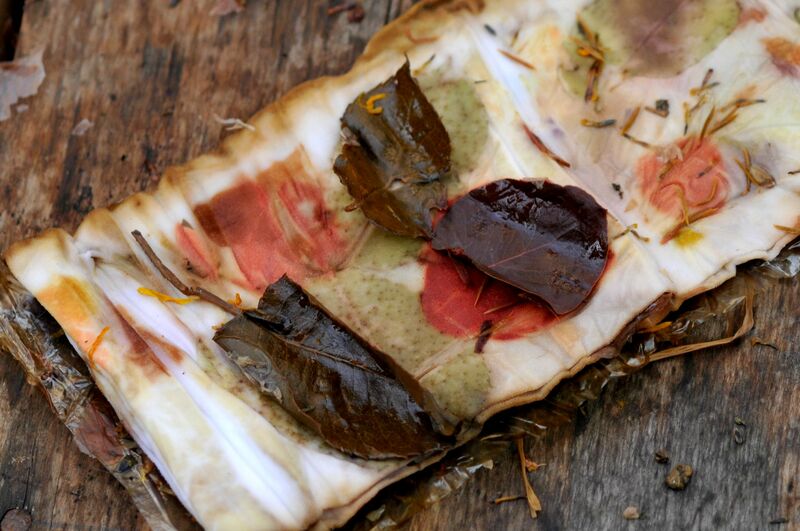 The silk samples shifted from red, to shades and hues of violet, teal blue and purple to crimson colors when reacted with the different mordant in the water. I am excited with the results and happy to share. 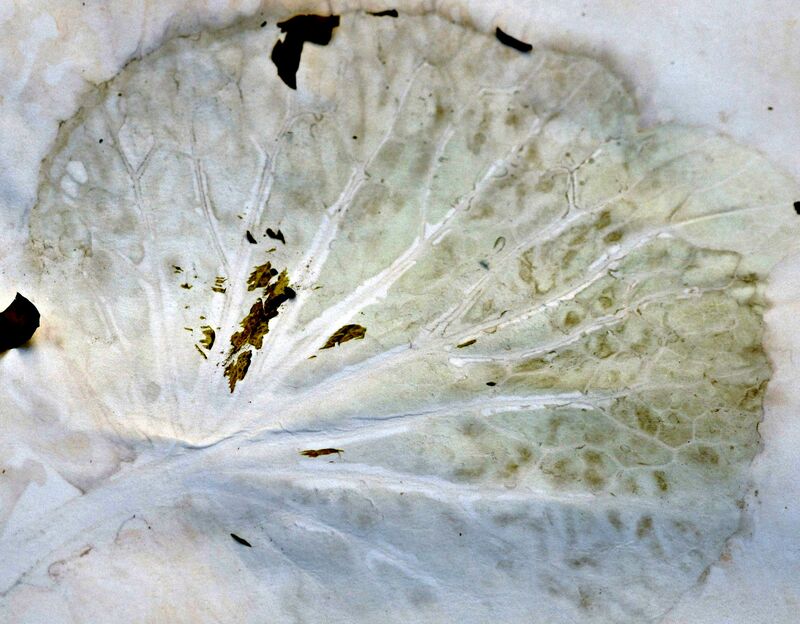 Next, I am interested to know if rosella will be a good plant material for contact printing… more next post.